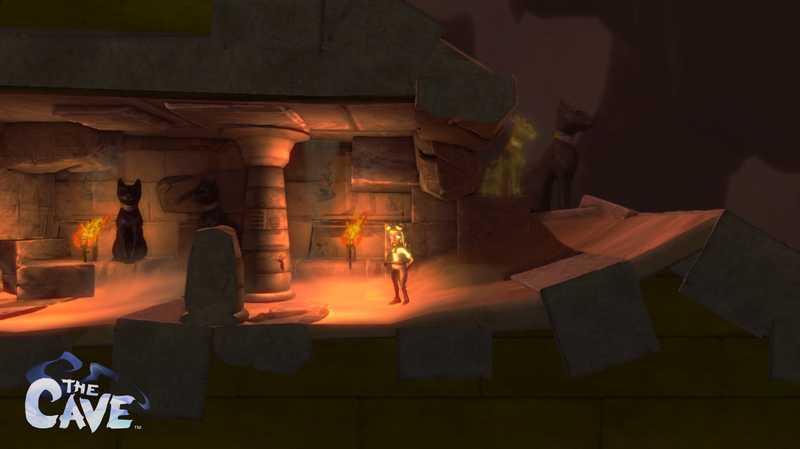 The titular location in the adventure game The Cave isn't your typical subterranean location. For starters, it can talk, in a sultry and mysterious voice. It can also give you what you most want, which is why seven different characters want to explore it. Though you'll only take three with you as you make the 2d trek through the surprisingly large and well-equipped cave, each of the oddballs is seeking something special from the dark depths. The monk craves enlightenment, the adventurer hopes to find her lost partner (and treasure), the time traveller wants to right a great wrong, and the creepy twins want some parents. Good luck with that, kids. You know your eyes glow, right? 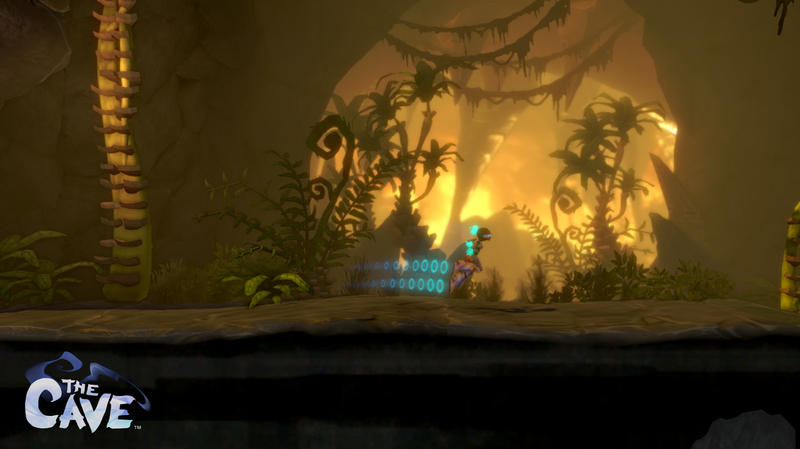 It doesn't matter which three characters you take into the cave, as they all function basically the same way - one isn't any faster or stronger than the other, and in any case, The Cave is "about the adventure, not being a platformer," according to the folks running the hands-off demo. For this particular demonstration, we saw the knight (who's seeking a sword), the scientist (searching for a great breakthrough), and the hillbilly (who, like many of us, just wants to find love). 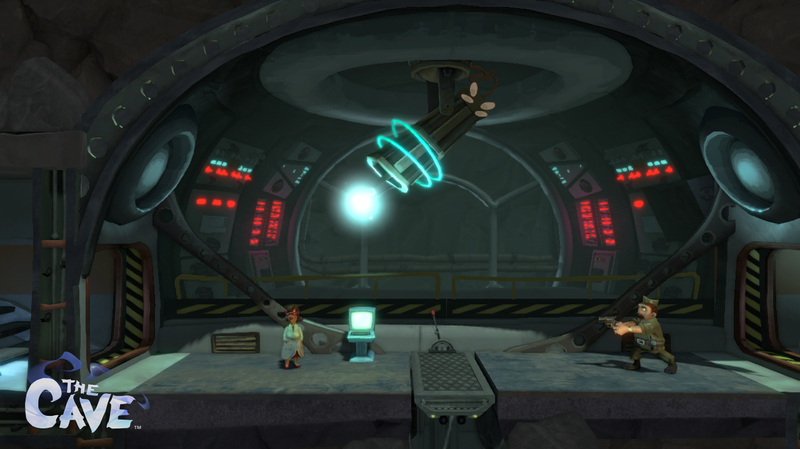 You'll coordinate the actions of all three characters to make your way forward through the game's many obstacles and puzzles. To get past a heavy gate, for example, two of the characters had to hold onto levers until the third could pass through and lock the gate open. You can either switch between characters manually, or if you have two buddies with you, you can team up for some couch co-op. 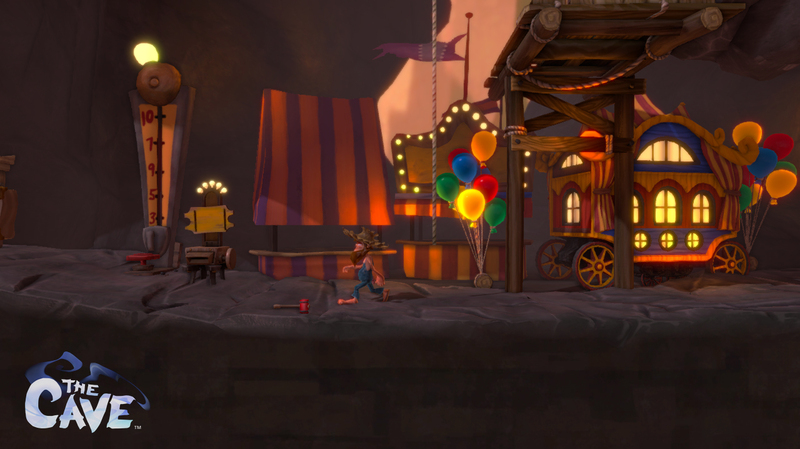 Given that The Cave comes from Ron Gilbert of Monkey Island fame, you might expect to be picking up all sorts of trinkets along your journey, but you won't be managing an inventory at all. You can only pick up one item at a time, and if you don't need it right away, you can simply set it down and come back to it. The challenge of the cave stems from figuring out how best to use your trio, not deducing how you're meant to use that rubber chicken. 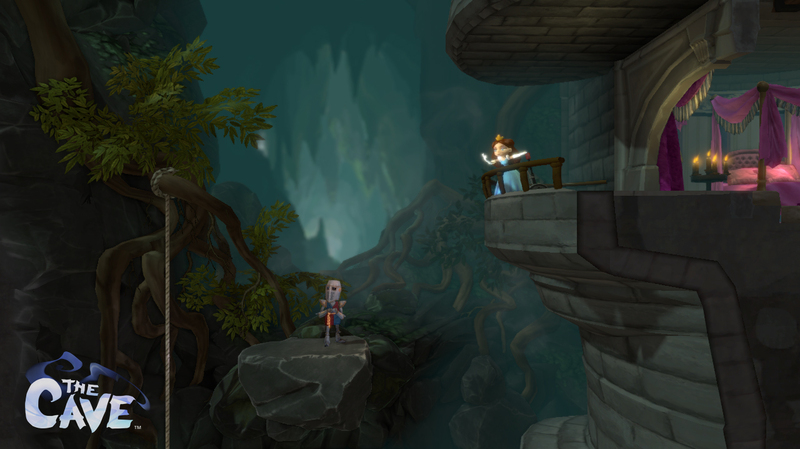 Although the characters play just about identically, each character has an area of the cave that is special to their personal story unique ability that you'll need to enter it. The knight, for example, has the Guardian Angel ability, which allows him to withstand damage and falls that would kill other characters; without that special feat, you won't be able to enter the castle. That means you'll have to play through The Cave with all seven characters if you want to fully explore its many twists and turns. 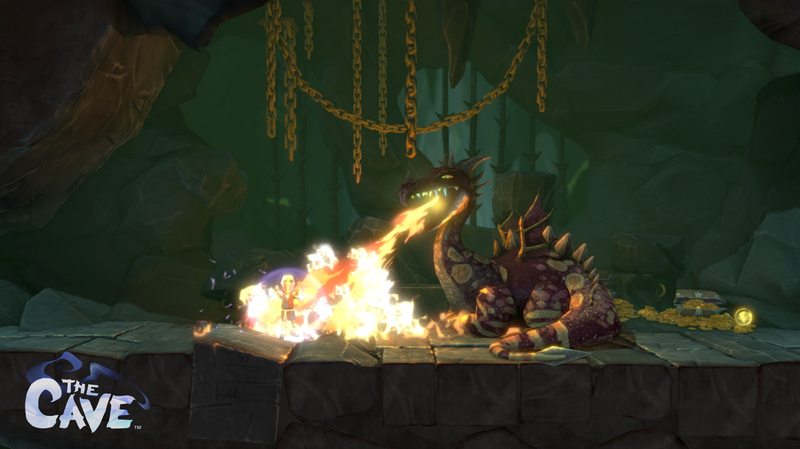 The puzzles we saw ranged from the relatively simple to the more elaborate, including one sequence where the scientist had to fix the hotdog vending machine, put the hot dog on a spike, and ring a dinner bell to lure out a huge dragon-like creature. The hillbilly, who was located far above, then pulled a switch that lowered a claw that picked up the dragon, clearing the way forward. Later, the knight had to nick the treasure from a different dragon so that he could get the princesses' amulet... but unfortunately the scientist forgot to lock the gate and the dragon ended up eating the little blonde royal. The dragon coughed up the amulet anyway, so it was unclear whether leaving the gate unlocked was actually a misfortune or not - or the princess would've ended up dead some other way if you had remembered to lock the gate. The presentation was bit rushed, perhaps due to scheduling issues, but definitely left me wanting to know more about The Cave. I'm eager to learn each character's unique story, and spend time in the goofy depths of the talking Cave itself. The cartoony visual style works well with the game's sense of humor, and based on what I saw, the puzzles look like they'll be challenging without being overly obtuse. 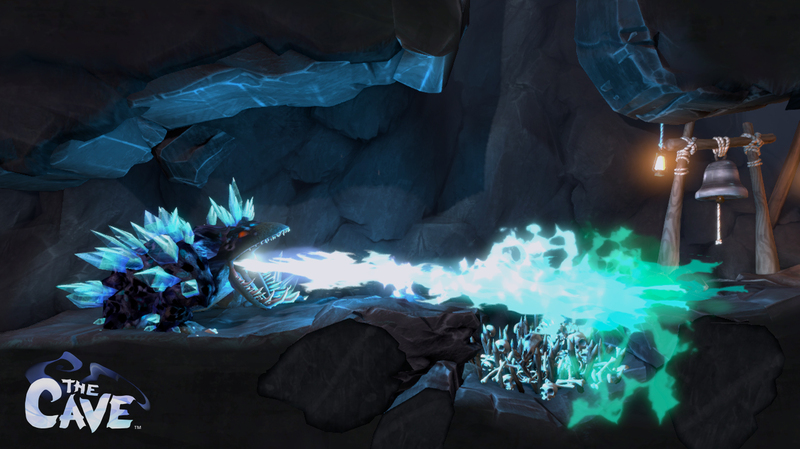 The Cave is due out in early 2013.